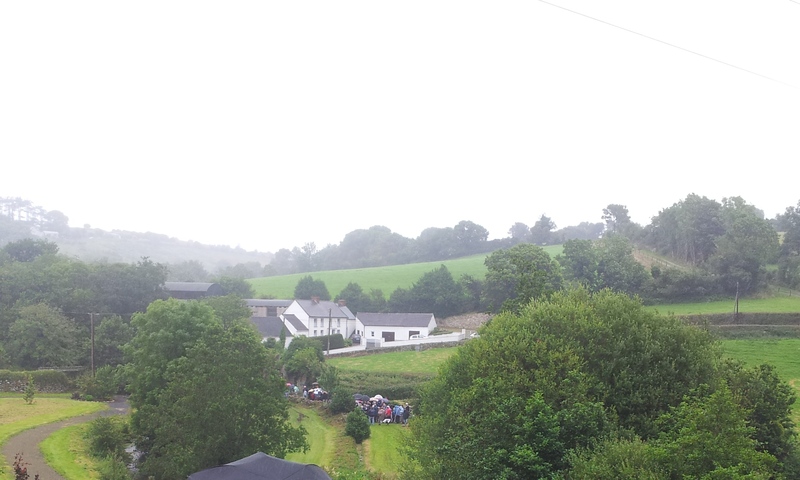 St Mullins is one of my favourite places and on Sunday the 22nd of July I headed along to the annual pattern day. A pattern day, is a day when people come together to perform pilgrimage at a holy well or saints grave, usually on the saints feast day. This is a tradition that can be traced back to early medieval times. 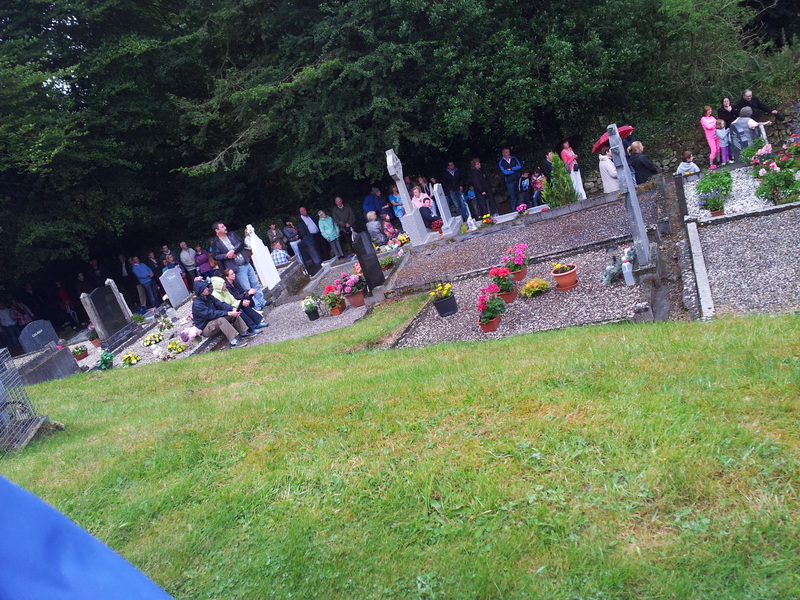 Nineteenth century accounts suggest there were originally two main pilgrimage days at St Mullins on the 17th of June the feast day of St Moling and the 25th of July the feast of St James. Today the pattern takes place on the last sunday before the 25th of July and prayers take place at the well and in the graveyard on the 25th of July. St Moling founded a monastery here in the seventh century and he is reputed to be buried within the ruins of the monastic buildings found in the modern graveyard. 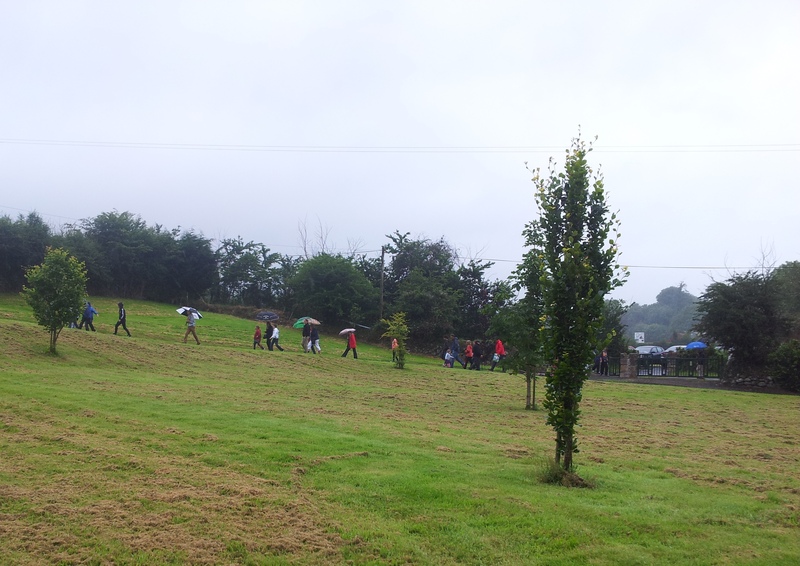 Pilgrims having being coming to pray to St Moling for centuries and St Mullins was one of the great pilgrimages in medieval Ireland. A single blog post is not enough to discuss the history and tradition of pilgrimage at the site, I will just focus on the modern pilgrimage. I hope to write a second post about the medieval and early modern pilgrimage in the coming weeks. On Sunday the pattern began with the blessing of the water of the holy well by the Parish Priest , the blessing was then followed by mass in the nearby graveyard (attached to the ruins of the medieval monastic site). 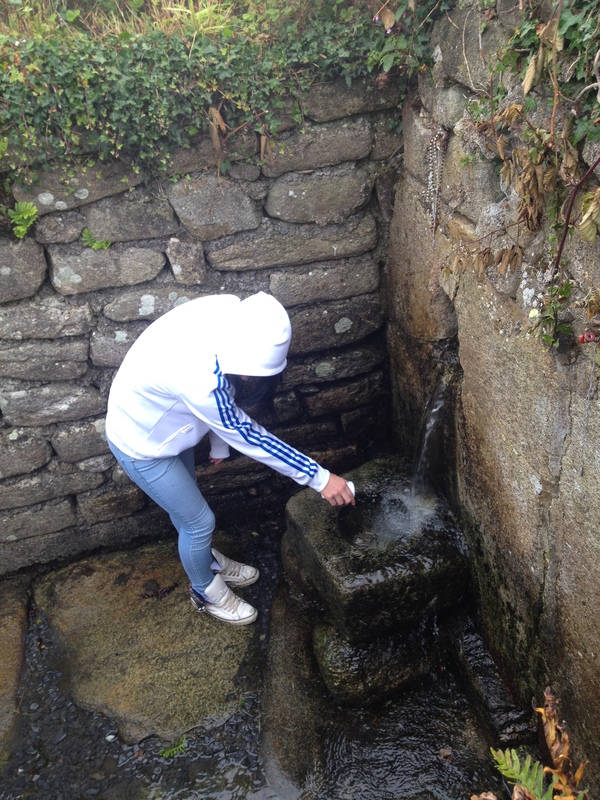 Following the blessing of the waters, pilgrims drink the water from the well and pray for their own intentions, before walking to the graveyard for mass. Some people attended mass first and then went to the well to drink its water. The waters from the well are reputed to have great healing powers. 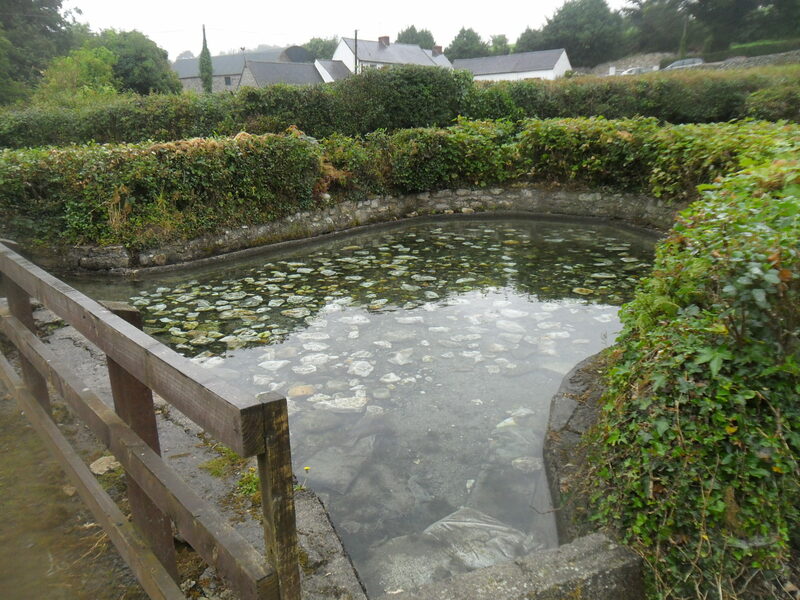 The well which is dedicated to St Moling consists of a reservoir filled by nine springs surrounded by a low wall. 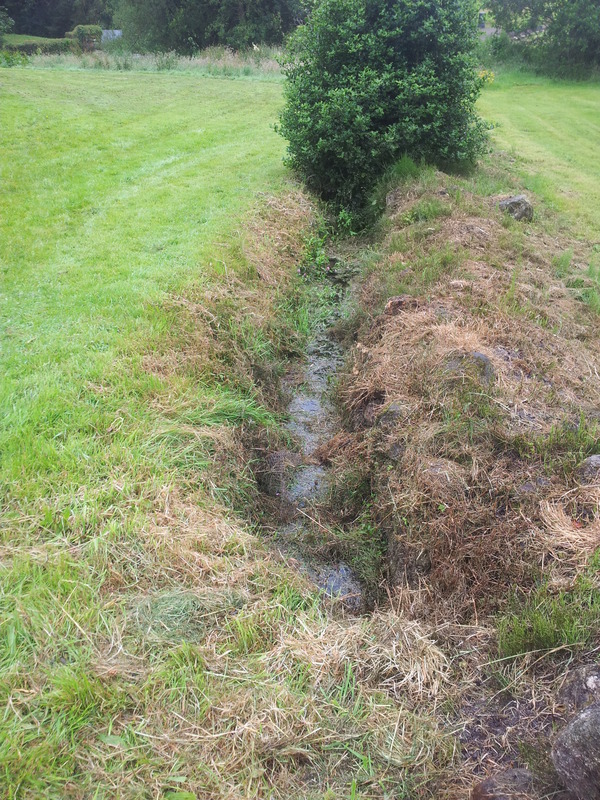 The water flows from this reservoir into a small roofless structure. To get to the water one has to enter through a narrow door. The water flows from the pool through two large granite holed stones in the back wall . A rectangular cut stone with a circular basin/depression catches the water as it flows out. 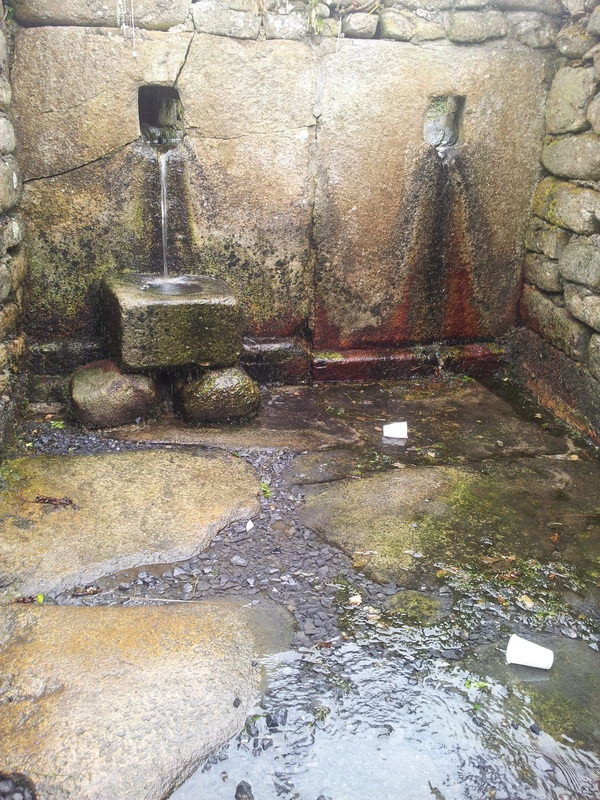 The water then flows over flag stones out the door and into the nearby mill-race known as the Turas (Pilgrim’s Way). When I visited the well on the pattern day in 2008, I met a lovely lady Molly who looked after pilgrims at the well and handed out water to them , she told me she did this every year for 50 years and her father before her did the same . This year she couldn’t make it as she had recently been ill, so two local student stepped in to help out. I forgot to ask their names, too busy talking. So they were in charge of filling cups with water and handing them to pilgrims who didn’t want to go inside for the water ( the flagged floor was very wet so not everyone wanted to get their feet wet). I also had a chat with Mr Joe Mahony who was originally from Coolrainey and is now aged 92. He told me that when he was young as well as drinking the water people would stick their heads under flow of water as it came out of the wall. It was the belief that this would protect them from ailments of the head for the coming year. Joe is a great character has been in his own words ‘ coming to the pattern day since before he was born’. 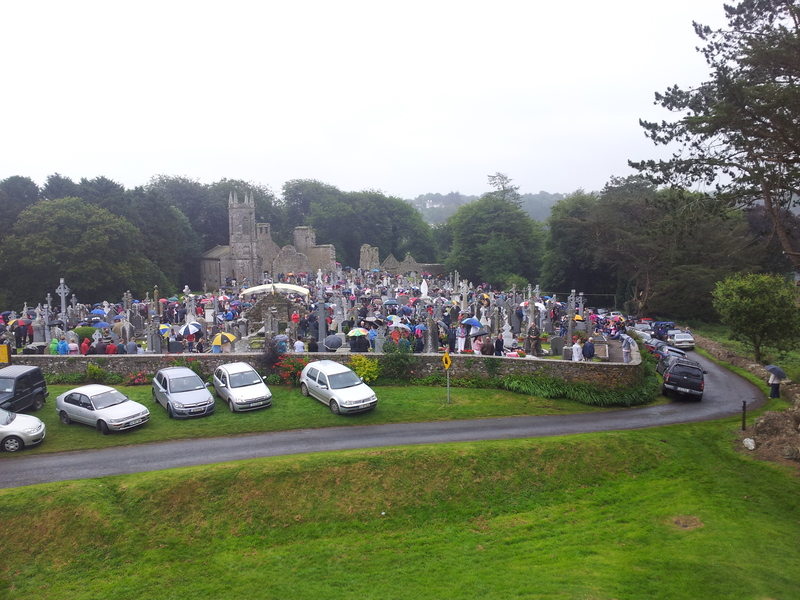 Mass began in the graveyard at 3. 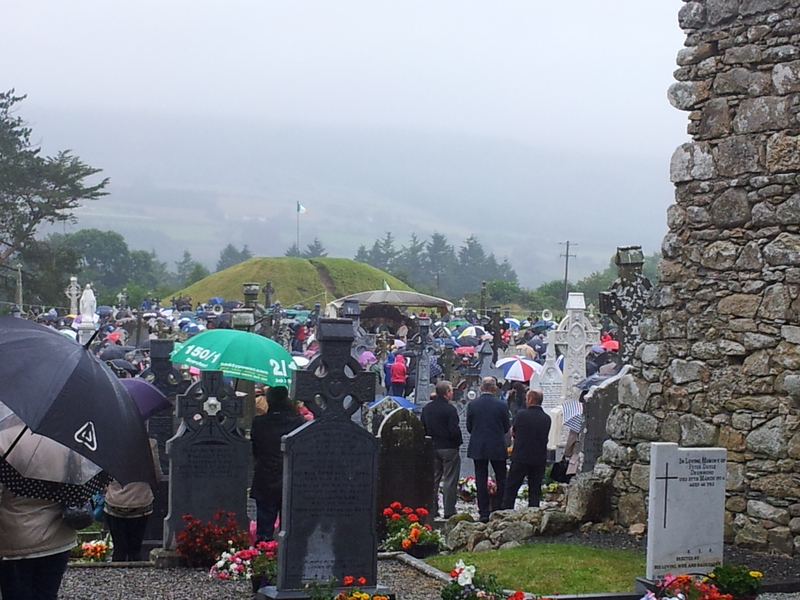 The weather was wet and a constant light rain was down for the afternoon, but despite the weather the graveyard was a see of coloured rain jackets and umbrellas. Some tried to take cover from the rain under the trees or in the ruins of the monastic buildings. People of all ages attendance on Sunday from small babies to the very elderly. There is a real sence that this is a very important event for the local community. The mass performed by the priest in the middle of the graveyard, at the site of a penal altar. It is amazing to think that this pilgrimage has been taking place for centuries and there is a real sence of community and history here. The Patron day is also a social event for local people, in the green beside the Norman Motte a short distance from the graveyard there were amusements and stalls selling their wares, and chip vans . The pattern is a day for people to meet up with friends and have a chat. Many local people who live in other parts of the county will come back especially for the pattern. 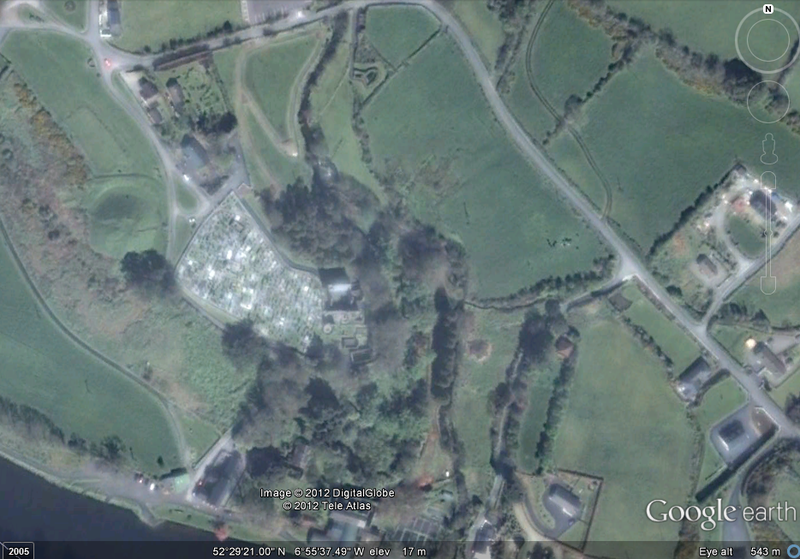 Following the pattern, I headed to the St Mullins Heritage Centre . The Heritage Centre is located in a former Church of Ireland church built in 1811 at the edge of the graveyard. It is well worth a visit and has lots of information plaques of the history of the area, St Moling and the pilgrimage. The centre also deals with genealogy queries . This entry was posted in Holy Well, Pattern Day and tagged Co Carlow, holy well, mill race, Pattern Day, Pilgrimage, St Moling, St Mullins. It is one of the best places in the world, and one of Ireland (and Carlow’s best kept secrets). It’s steeped in archaeology, history and folklore and the museum is well worth a visit. The parish priest, Father Aughne walked us around the places where St. Mullins dug to reroute the water for the mill. Lucky you Christina. Its such a special place.